A big benefit of backyard farming is that you can make the same level of income as traditional farmers, but eliminate their expensive and sometimes environmentally harmful practices. Take pest management. A lot of the concern about the safety and quality of our food is because of pesticides. Backyard Riches members don't have to use them. Why? The plots that they manage are so much smaller, and they are out working in them every day, so natural pest management is totally do-able. To control aphids, they "seed" their gardens with ladybugs. You can order them from Costco for $21.99 per thousand. 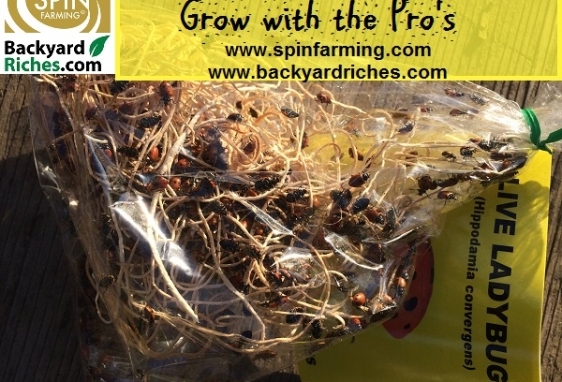 Backyard Riches report that ladybugs have made a significant difference in reducing the aphids, and in the following spring after their seeding efforts, they say many ladybugs survive the winter and report back for duty. So here's how you might be able to eliminate even their modest expense: in the fall time, after the leaves have fallen to the ground, ladybugs use them as a perfect place to breed. So think twice about raking up those leaves this fall. By putting them in bags, and sending them off to the dump, you're also trashing a very effective, no-cost backyard farming pest management system.